It’s a minor skip in the storytelling, and the other missing flashback page creates even less of a gap, so the whole thing flows together fairly well, more or less (aside from this glitch described by BobH a couple of years back). 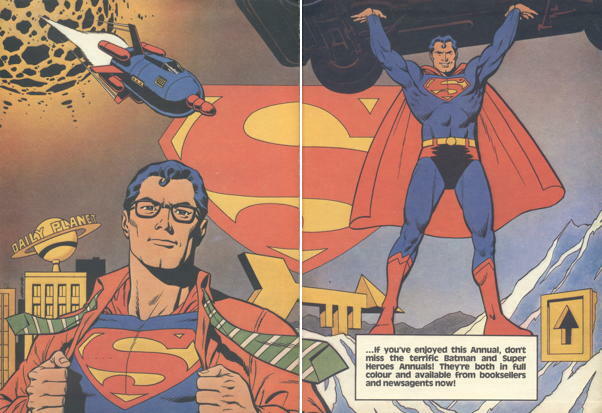 There is a Superboy reprint (“The Slay-Away Plan”) inserted between parts two and three, as well as a two page history of Luthor in the comics and the movies. It’s a nice item, and I’m very grateful to Mr. S.B. for sending it my way. Thank you! Gibbons AND Bolland artwork! NICE. There appears to be a misprint where they accidentally spell “color” with a u. Does that make it more valuable? The British DC annuals of the 70s & 80s are well worth seeking out as they’re riddled with gorgeous art from messrs Bolland, Gibbons, O’Neill, Talbot, Leach, Higgins and Bolton. As well as stories from a certain beardy-weirdy named Moore. The Suckmaster Burstingfoam thing, I feel I should explain, comes from a Fry and Laurie sketch – http://www.youtube.com/watch?v=JG-7wMV-HRc – from a long, long time before Hugh Laurie was Dr House. And you’re welcome! I happened to have one sitting around, and was unlikely ever to read it again, to be honest. The least I could do for ten years of dedicated blogging. These UK annuals are generally quite interesting, and sometimes well worth picking up. I suspect that these A4,hardcover reprints were a lot of British readers introductions into the world of US comics. They were often recoloured quite amateurishly, sometimes didn’t reprint exactly what they ought to have, and were filled out by sometimes execrably bad editorial material. But on the other hand, they were printed on good paper, often had beautiful covers by British artists like Bolland and Gibbons and were sometimes the only way for children in poorly-served areas to access these sort of comics. 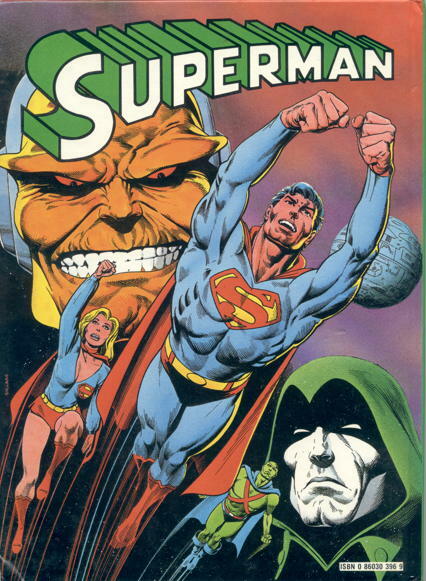 I got one (or, if I was lucky, two) every Christmas for years and now, 30 years later, I’m still reading Superman comics. But I bet even Brian Bolland could’nt make that bloody collar look good.